A full thirty years after Mikhail Gorbachev set the USSR on an irreversible trajectory toward a more open, humane society – and ultimately, toward the country’s dissolution – many Russians continue to reject the idea that perestroika represented a step forward for the country, especially in terms of its geopolitical consequences. In an RIR exclusive, Gorbachev’s former press secretary Andrei Grachev asks why the perestroika era remains such a controversial part of the nation’s history. The attitude to perestroika, its outcomes and consequences in Russia remains controversial even now. The "Gorbachev paradox" is that both the opponents and many of the supporters of the Soviet Union’s last leader believe the perestroika that he launched ended in a failure. Consequently, some damn Gorbachev for what he managed to achieve, while others blame him for the fact that he did not fulfill all his promises. Most of all, the initiator of perestroika is accused of inconsistency, wavering and tactical zigzags. His cautiousness, his yearning to propel society forward by giving it the opportunity to ripen for change, to push it from behind, rather than to lead, were perceived by many as inconsistency and indecisiveness. However, if one tries to connect at least the major changes that have taken place over those years in the former Soviet Union and throughout the world with a dotted line, the zigzags of the "indecisive" Gorbachev would stretch in almost a straight line... I will name the fact that, in my opinion, is perestroika's "insoluble residue": Russia took a bite from the "apple" of free elections and glasnost, having included the right to freedom of expression and information in its list of public priorities. Having dropped its claims for an alternative civilization and global submission to its ideological doctrine, Moscow took the initiative to end the Cold War, which had almost led to a third world war. The result of these years was the actual reunification of world history, which split into two streams in the early 20th century, after the Russian Revolution. However, in our mortal world, everything has its price. The price that, against his will, Gorbachev paid for the transformation of his own country and world politics was the collapse of the Soviet Union and his own resignation. The Western world, in turn, could not resist the temptation to declare itself the absolute winner in the Cold War and the sole heir to history. As a result, Gorbachev’s Western partners, on whose common sense, even more than financial assistance, he hoped, proved no more reliable allies than his former party colleagues who had betrayed him. 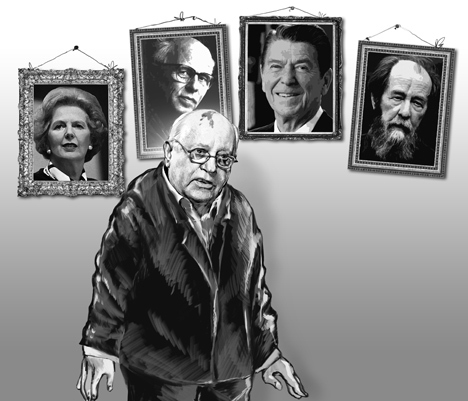 Today, Gorbachev blames the West not for the failure of its leaders to provide sufficient help to him (he knows that it was not them that on which the fate of perestroika depended), but for its inability to sensibly use the unique chance that his new policy opened to the world, for perceiving the move of Soviet society toward democracy only as a manifestation of inner weakness. Neither the project of the "common European home," part of which the reformed Soviet Union was to become, nor the idea of creating new structures of collective security on the continent (including the possible Security Council), which would help to avoid the tragedy of the bloody war in Yugoslavia, and the drama of the current civil conflict in Ukraine, were implemented. It turned out that it was easier to destroy the Berlin Wall itself than to do away with the logic that spawned it and the psychology of programmed enmity as an instrument of policy. The preservation of old visible and invisible walls and barriers and the emergence of new ones shows that in the 21st century, politicians – both of the West and the East – are not ready to abandon their prejudices and stereotypes. It is clear that this is the reason the Cold War was replaced by numerous "hot" conflicts around the world. And the former, faded old Cold War that Gorbachev believed that he was burying for good during his meetings in Reykjavik, in Malta, in Washington or Moscow with past American presidents is rapidly returning to Russian-American relations. If 30 years after the beginning of perestroika, it is seen in Russian society as a political failure or even as a subversive anti-national project, it means that the main motive of perestroika, actively supported at the time by the entire Soviet society – a project of the reunification of Russia with world history and the democratic renewal of the country – is either misunderstood or is being consciously rejected. As are pluralism of opinion, the rule of law, fair elections of leaders, the inviolability of the human person, real competition in politics and economics and government accountability to the public. The author is a former spokesman for Soviet President Mikhail Gorbachev.